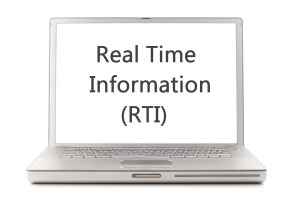 From April 2013, HM Revenue & Customs (HMRC) is introducing a new way of reporting Pay As You Earn (PAYE), known as Real Time Information, or RTI. The new system introduces changes to the way in which employers must report the payments and deductions they have made under PAYE. Under the current system, inaccuracies can go unnoticed for some of time, with the result that individuals can go for some time unintentionally paying the wrong amount of tax. The aim of RTI is to help to ensure that individuals pay the correct amount of income tax and national insurance throughout the year. Each time you pay an employee you will have to submit a monthly report which shows deductions, such as Income Tax and National Insurance contributions (NICs) together with starter and leaver forms where applicable. This also applies to people on a low income, for example £600 per month, who would not normally have any tax or national insurance to pay. The way tax and National Insurance contributions are calculated will not change, and the dates by which you must pay HMRC will stay the same. You will no longer need to submit an end of year return, form P35, starter and leaver forms P46 and P45, to HMRC, as the information will be submitted on a monthly basis. Please note that forms P46 and P45 are still issued to employees.